Mike Kolodny, you look like every guy I hung out with in the bowling alley parking lot on weekends. Can I bum a sip of New Coke? How about a quarter for some Ironman Stewart's Off Road Racing? You're a true friend, Mike Kolodny. Without any "previous year" stats to distract me, today's the first time I've really noticed TCMA's address in that tagline and P.O. Box #2 is a pretty low number. 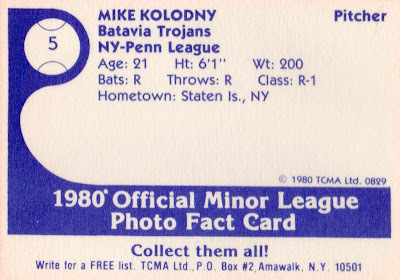 So where were 1980 collectors actually writing for those free lists of photo fact cards? 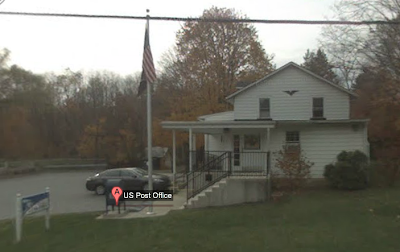 Amawalk (the NY town) is near Connecticut's western border and this rambling white house is their post office, where founder Mike Aronstein or another TCMA employee would collect your letters from box #2 and send back their mail order catalog. 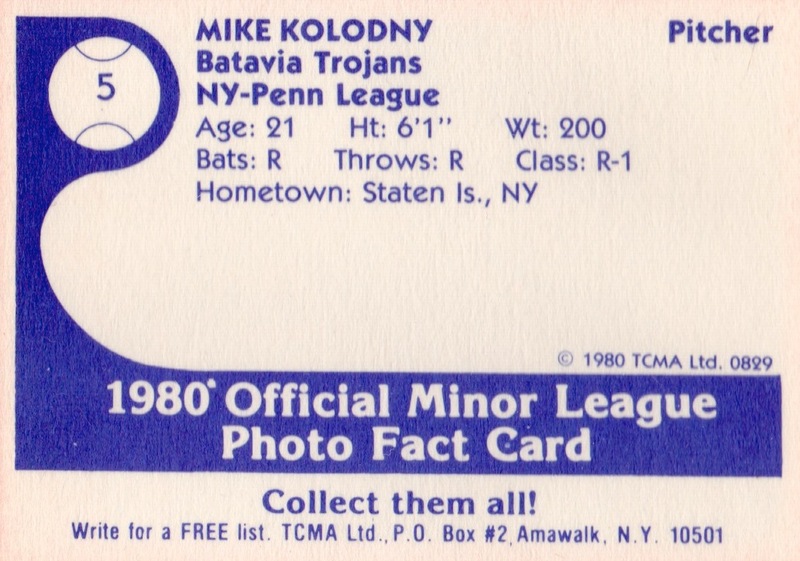 If you count both major and minor leagues, TCMA printed 61 sets that year alone! 30 Batavia Trojans appear in today's set, future big leaguers in bold. This set's biggest name is future 2-time All-Star Kelly Gruber, who hit a high peak in 1990 by capturing the AL's 3B Gold Glove and Silver Slugger awards for Toronto. Unfortunately, Kelly lost the second half of his career to a degenerative neck injury, ultimately retiring after a 1997 comeback attempt in AAA. Value: This #5 cost $2 at MinorLeagueSingles.com. I've seen eBay sellers asking as much as $55 for the full set, but that's out of character for a team thin on future MLB stars. 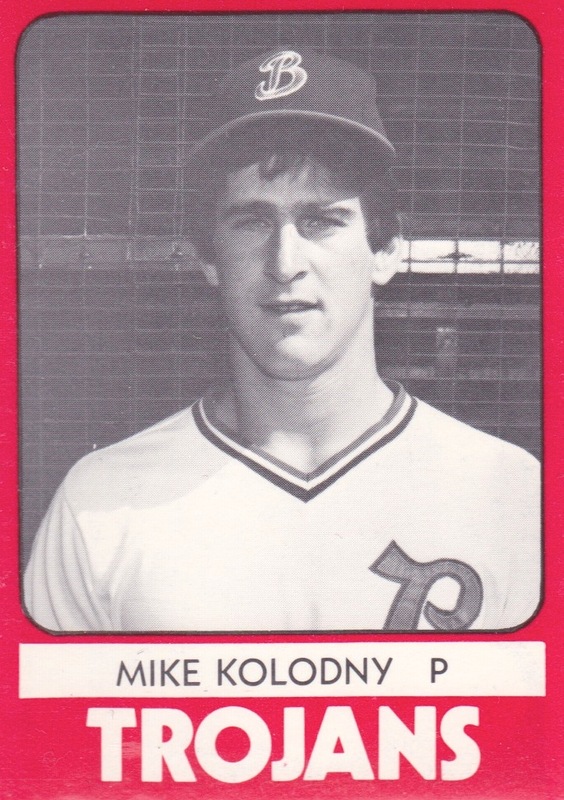 Fakes / reprints: TCMA reprinted several 1980 team sets for "collectors kits" later that decade. Those cards come with black ink backs, while originals have today's blue ink.